Strawberry shortcake pound cake is a slight twist on a classic. 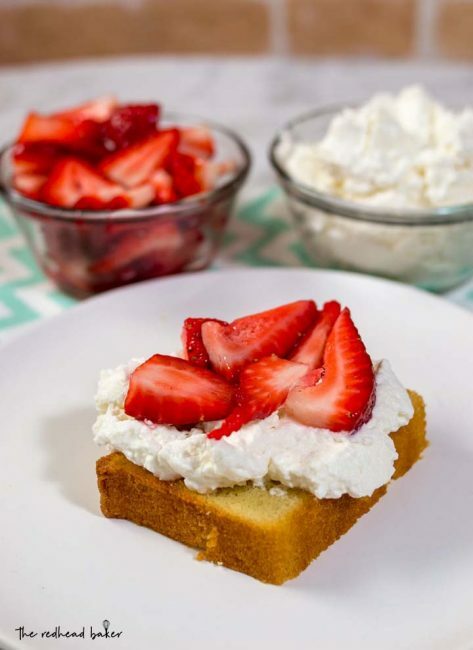 Instead of shortcakes (biscuits), I use toasted slices of pound cake topped with macerated strawberries and fresh whipped cream. Welcome to Day 6 (the last day!) of #BrunchWeek, hosted by Love and Confections and A Kitchen Hoor’s Adventures! Don’t forget to hop on over to my Sponsors and Giveaway Information Post to read about the great prizes and enter to win one! Strawberry shortcake always reminds me of my grandmother. It was one of the desserts (yes, one of several) that she always served during summer cookouts. Even if she was expecting just 6 guests for dinner, she’d have food and desserts for 12. 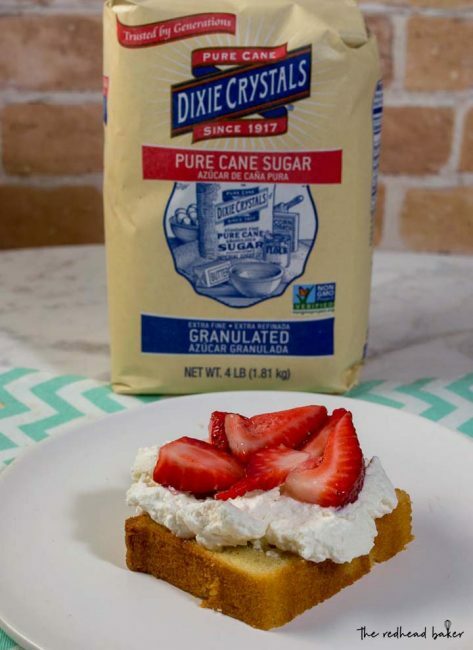 For the longest time, I didn’t even know that pound cake wasn’t the traditional cake used in this dessert. 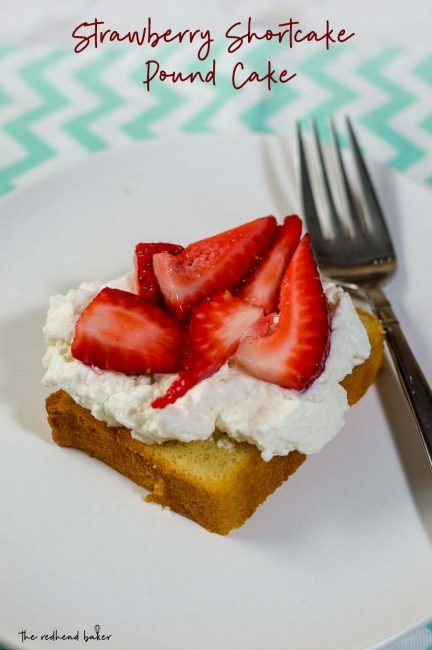 She always used pound cake, or angel food cake, fresh strawberries, and whipped cream from a can. 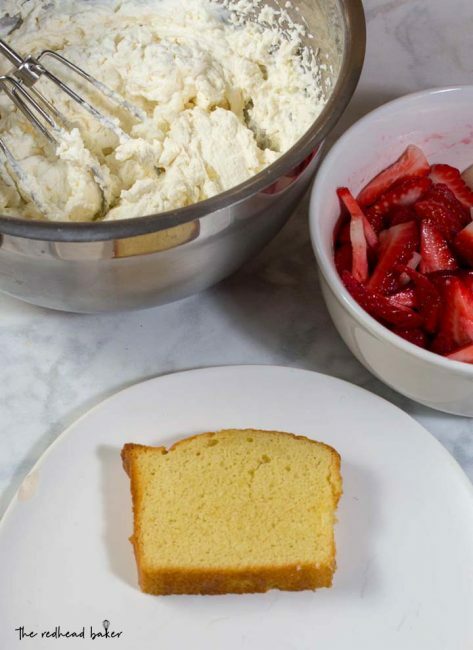 I also use pound cake, though I toast my slices in the oven first, so that the cake absorbs the juices of the strawberries. 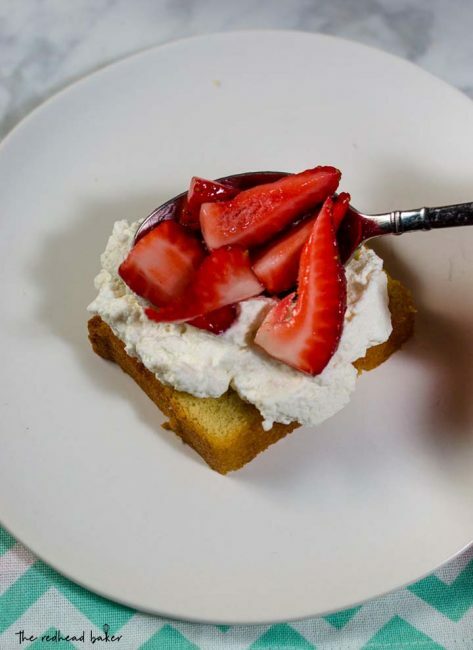 I macerate the sliced strawberries in Dixie Crystals sugar (and Grand Marnier if no children will be eating the dessert), and whip my own cream. 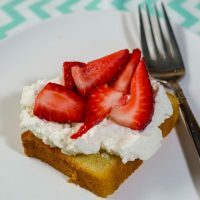 As much as I love chocolate desserts, I do love this strawberry shortcake pound cake dessert in the summer time. It’s light (ish), with fresh summer flavors. It also makes a delicious finale for spring and summer holiday meals, cookouts or get-togethers at any time of day, from brunch to dinner! Preheat oven to 350°F. Lightly grease a 9" x 5" loaf pan. In a large bowl, beat the butter until very light. Gradually beat in the sugar, then the eggs, one at a time, stopping the mixer to scrape down the sides and bottom of the bowl between additions. Continue beating until the mixture is light and fluffy. In another small bowl, whisk together the milk and extract. Alternately add the wet and dry ingredients to the butter/sugar/egg mixture, starting and ending with the flour. Stir to combine after each addition. Pour the batter into the prepared pan, smoothing the top. Remove the cake from the oven, and loosen its edges. Wait 5 minutes, then carefully turn it out of the pan onto a rack to cool completely. Wrap in plastic wrap and store in the refrigerator until ready to serve. Thirty minutes prior to serving, place sliced strawberries in a large bowl. Sprinkle the sugar over top and toss to coat. Let sit for 30 minutes. Sprinkle the powdered sugar over the cream and continue beating until medium-stiff peaks form. Beat in the extract. Cover and refrigerate until ready to serve. We used to make this for dessert all the time while I was little. Looks so delicious.